Charlie Davies' first try of the season saw Dragons secure a shock win at Gloucester. Scrum-half Charlie Davies grabbed a close-range try after 76 minutes to put the holders out and end their 15-game unbeaten European run. They now face a tricky tie at Montpellier, the second-placed side in the Top 14, who won 25-19 at Sale Sharks on Friday night. Victory will delight Dragons director of rugby Lyn Jones, who missed the match through illness. Both sides started at a high tempo and Morgan galloped twenty metres down the touch-line on the overlap, to score after 11 minutes. Laidlaw landed two penalties to Dorian Jones' four successes from six attempts in the first half. Both scrum-halves Sarel Pretorius and Laidlaw were yellow-carded in that period, with Dragons holding a surprise 12-11 lead at the break. Further points from the tee built on the visitors' lead but Gloucester levelled the scores after the hour when McColl ran onto James Hook's grubber for Laidlaw to convert. 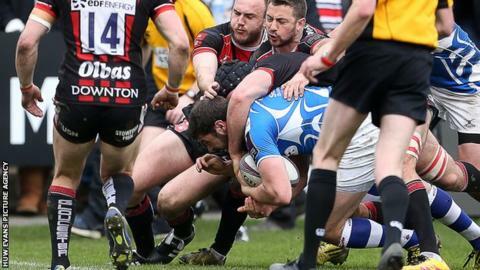 The Scotland scrum-half landed another penalty on 72 minutes before Dragons' gamble to kick for the corner rather than at goal paid off. A 12-man maul from the line-out was halted, but Davies crashed over from close range, and the Welsh side held out for the remaining three minutes to spark wild celebrations from their fans in the Shed. "That's probably as low as it gets. In the two years I've been here, that's as poorly as we've performed. I'm not taking anything away from the Dragons, but we've got to be better than that. "For a lot of us this will be the first time we're on the back of five consecutive defeats, so this is where you find out the character of people in the squad. "We know we've got the strength in the squad so that we can compete across the length and nature of the season. "This year we've found it hard to maintain the level of performance required, but other teams have done it so we have to look at why we haven't been able to do that."